to even use them in a sentence. information about growing your blog and monetizing it. was all of the wonderful women (and a few men!) that I met. exchanging cards, telling what brought us to Haven, etc. is blogging along with her and he attended all the seminars too. You have to read Leo's blog post "A Male Haven Maven" that the above link will take you to. ...and Janis of All Things Beautiful. Here is a group shot with some other bloggers too. Lori, Sallie, Janis, Caroline of Home Depot's blog The Apron, Kerry of House TalkN, and me. 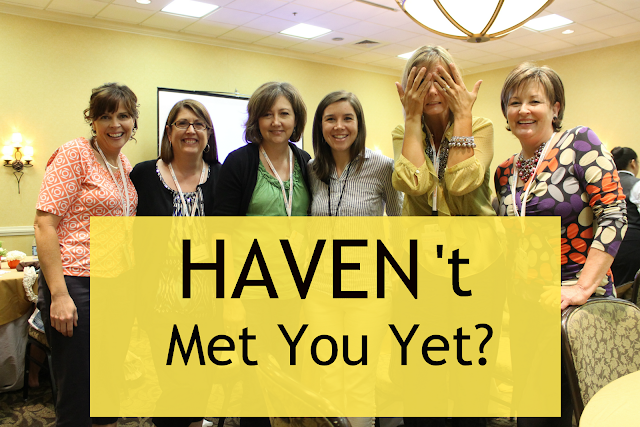 would like to meet at Haven 2013...I just haven't met you yet. where Rhoda has so many good pictures of the conference. This looks like so much fun! Thanks for passing on some of these tips for those of us who didn't get to be there first hand! I cannot tell you how excited I was to see your smiling face IRL! You have been such a sweet, supportive and kind commenter for so many bloggers! Thank you so much! Thanks for putting our picture in your blog post. It was so much fun meeting you and your husband, too. Can't wait until the next conference, and I didn't understand all that stuff, either!